I’ve been talking for a while now about how we introduce the idea behind machine learning to school kids. I’ve given several talks about it but I’ve also tried out a couple of approaches to it. Now I’m trying out another: training a machine learning bot how to play Top Trumps. 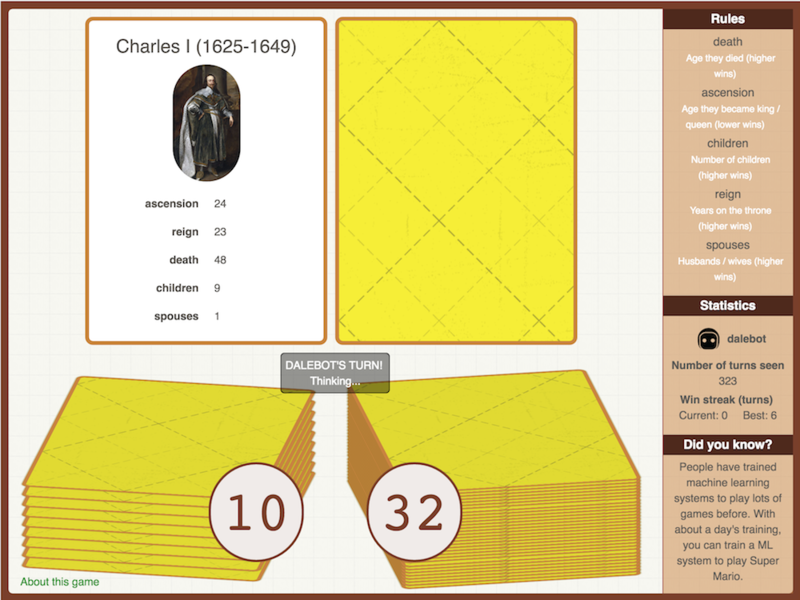 I’ve put a demo at toptrumps.eu-gb.mybluemix.net. It’s basically Top Trumps: that card game I used to play as a kid where you choose one of the attributes on a card, and if it beats the other player you get their card. Except it’s online, and you’re playing against a computer. But the computer hasn’t been given any strategies on how to play, and has to learn from the player.